Today we take a look at the ‘youngest’ of the three classes in the Machismo 12 Hour; The Super Sport Class (S1). 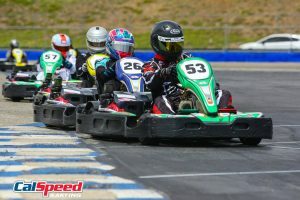 Now in its 5th year, this class is essentially the ‘pro’ category for the sport kart wielding teams, hosting both the top level drivers from CalSpeed’s Super Series and IronMan Series, as well as top talent from other levels of motorsports. 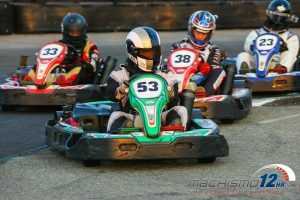 Utilizing the same type of kart as the Sport category, the differences in this class -aside from the lack of an experience restriction- are three primary things: No rules on drive time, minimum weight per driver, and kart swapping at the fuel stop. 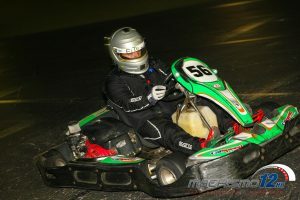 The first two are kind of connected; unlike the other sport kart class that has a team average weight, and therefore a minimum amount of seat time per driver as an equalizer, the Super Sport category requires each pilot to ballast up to a 200lbs minimum. Because every driver on course is at equal weight, there is no need to police drive time, allowing for some of the widest ranges in stint length. 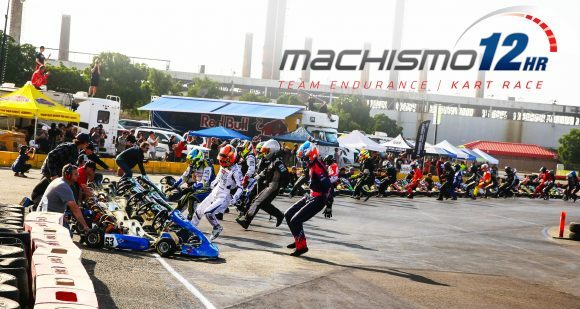 The last part about the fuel is two-fold; first, each team starts the race with whatever fuel amount is left after the 1-hour qualifying session, and each team swaps out their kart whenever they get fuel. With 2+ hours to each tank, this class will run in the neighborhood of six or so karts over the course of the twelve hours. 51 drivers are set to take on this event, compiling 13 teams that range in size from 2 to six, with just a single group taking either end of the spectrum. The majority of the teams have decided to go with a 4-driver lineup, with the complete spread as follows: 1 two-driver team, 3 at three, 8 at four, and 1 each for teams of five and six. New this year is the inclusion of stints to the class, now requiring the S1 class to do 17 driver changes or ‘double stints’ in an effort to add a bit of strategy to the class. In years past this category has seemed more like a 12-hour sprint race at times, with every team going flat out to get -and stay- at the front. While sheer pace will still be of the utmost importance, this class now has the ability to duck out of traffic or shake things up like never before strategy-wise. The first team we’ll talk about today in Super Sport is led by 2016 winner and podium finisher, Sean Fite. Fite marks one of three drivers on the T4 Stone Cold team, joined by 2013 team lead and winner in Sport Tony Severson, as well as fellow podium finisher Chris Huerta, looking to best his 2nd place from 2015. 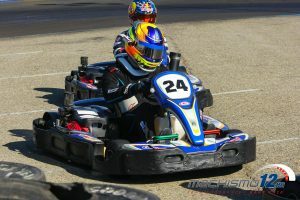 The trio are arguably three of the strongest strategic minds when it comes to endurance kart racing, and all three are also coming off their personal best seasons in the CalSpeed Super Series. Expect them to be at the front for the duration, and right in the thick of the battle for the win. Perhaps the strongest team on paper for the 2018 edition of the Machismo, team Mahkra former Pro Class winners and multi-time hardware winners joined by one of the best in the strategy business. Super Series regular and 2016 Pro class winner Charles Eichlin teams up with fellow ’16 champ Wes Dent, as well as former podium teammate from 2015 Jerott King, who also won in the Pro category in 2013. Rounding out the on-track talent is east coast endurance karting ace Andrew Wood -who is looking for his first piece of Machismo hardware- while Justin Tolman takes up the headset for the squad, and will be running things from the sidelines. Yet another very strong entry into the Super Sport category, The Masters Champs squad sees double-podium winner at last year’s Machismo Jose da Silva join up with newly crowned Super Series Masters champ Diego Morales. This duo will also be running in the P1 category, while their S1 teammates take to the course; 2017 Pro Class winner Alexander Bermudez, and recent IronMan and Super Series winner Andres Prieto. A seasoned group of sport karting veterans, these guys bring both speed and consistency to the table, while Morales adds a very strong strategic lead for the quartet. Baguette Racing started as a Super Sport team two years ago, and now make their return not only with their core team, but also this second entry that sees two of its founders doing double duty; Maximillian Bui and Prescott Campbell. Also running on their sister squad with fellow founders Jason Zide and Nicolas Bel, their MRC squad is bolstered by none other than the now 2-time Pro Shifter SuperNats winner, Billy Musgrave. 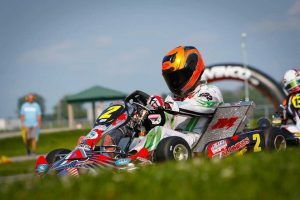 This will be Musgraves’ first foray into the sport karting world, and he brings along another up an coming shifter kart pilot in the young Vicente Salas. T4 Autosport’s second entry into the Super Sport category, the T4 Tacocat lineup sees a couple of hardware winners team up with a pair of very solid endurance karters to make up this team of four. Led by another endurance karting ace from the other coast in Ryan Curtin, he’ll be splitting his time between this and his Pro Class Duties, where he found the podium last year. Former Sport Class winner Caden Thure fills in the experienced part of the team while joining the two former podium runners are Luis Calderon and Cameron Rose, a duo that has shown well in Machismos prior.